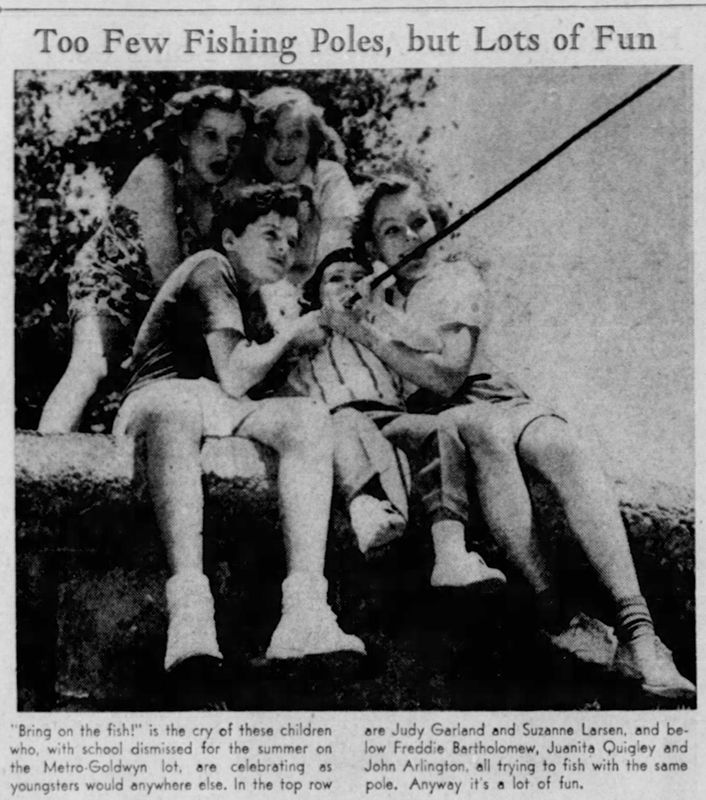 July 25, 1937: Judy goes fishing with other kids on the MGM. The caption for the photo makes it appear that the kids were taking advantage of the summer break from school to go fishing. 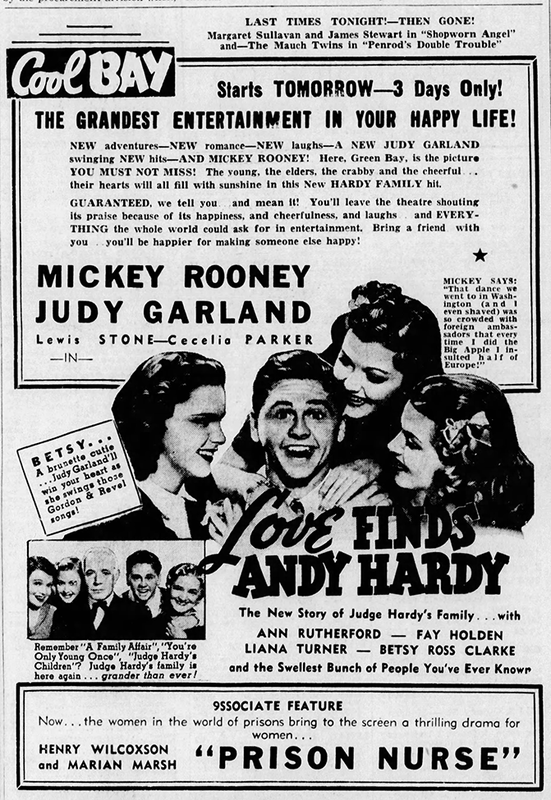 July 25, 1938: Love Finds Andy Hardy was the surprise hit of the summer. Here’s a nice review plus an article about the success of the film that notes that based on the film’s success more entries in the series would be made. How right they were! Of note is the fact that out of Andy’s “loves” in the film, it’s Judy who is singled out in almost all of the reviews and ads over the more glamorous Lana Turner and Ann Rutherford. Judy was very insecure about her appearance and constantly compared herself to the glamour queens/teens at the studio, especially Turner. It’s a shame she rarely (if ever) saw any of these accolades. July 25, 1939: Here’s a paragraph from Louella Parsons’s latest column. Talk about fiction! 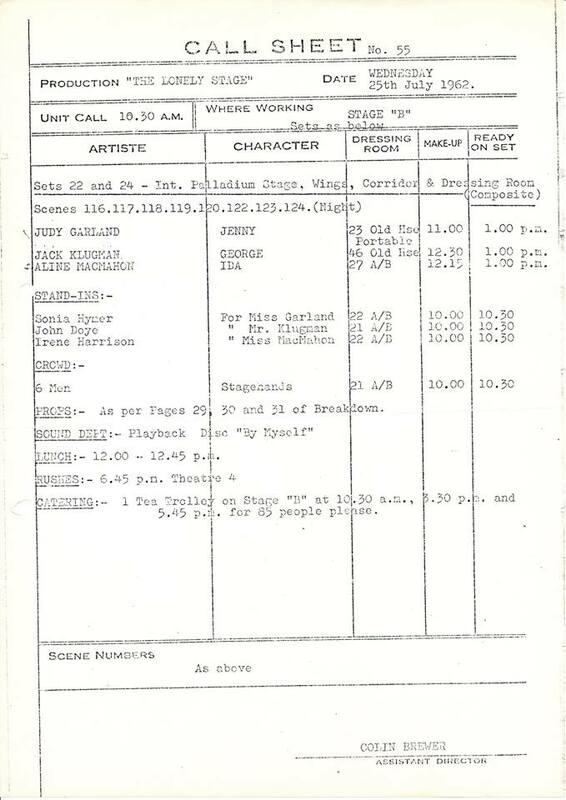 July 25, 1941: Judy’s last day of filming for Life Begins for Andy Hardy consisted of retakes. She had started rehearsals and pre-recording sessions for Babes on Broadway during this last month of filming on the Andy Hardy movie, her last appearance in the series. 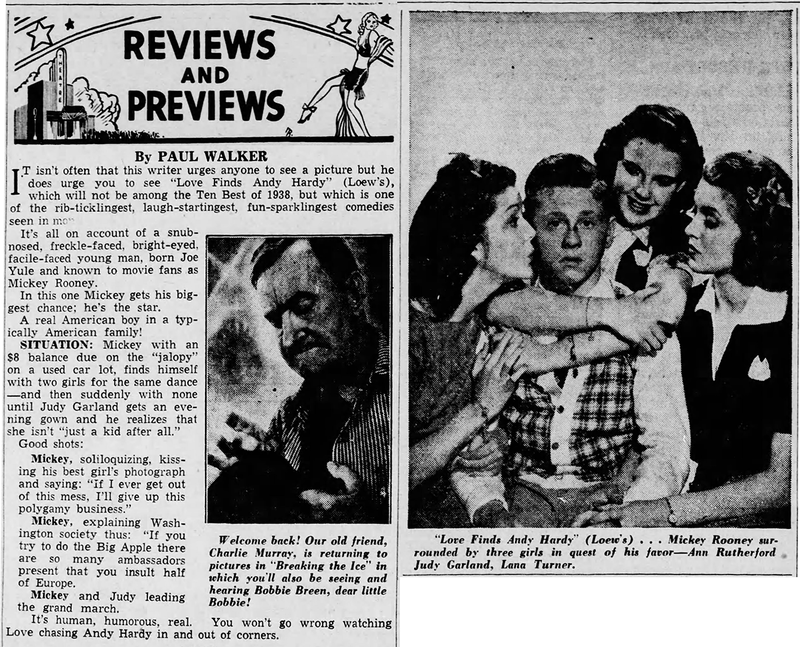 Get more details on Judy’s three Andy Hardy films here. 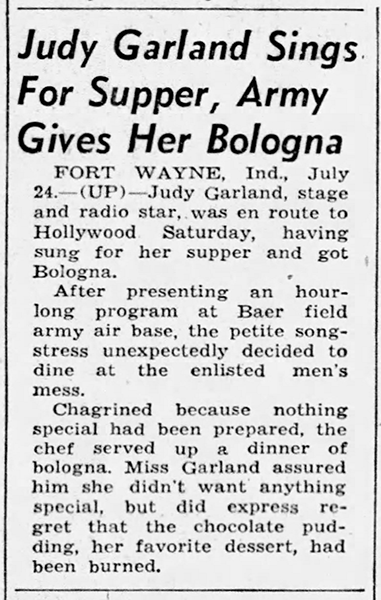 July 25, 1943: Judy’s tour of Army camps with the USO continued. These articles reflect the fun she and the soldiers had. 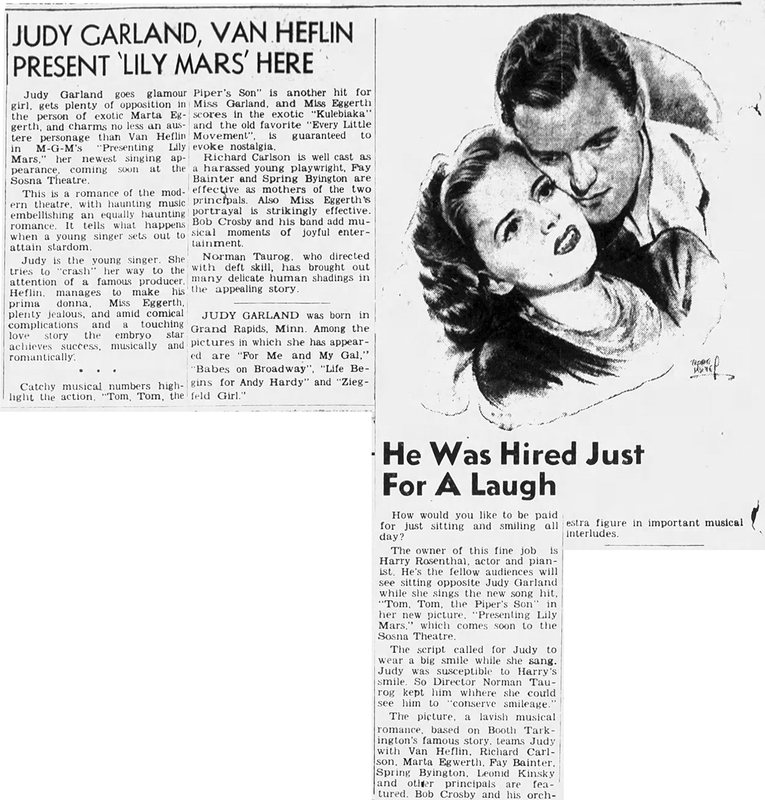 Still in theaters at the time was Presenting Lily Mars. 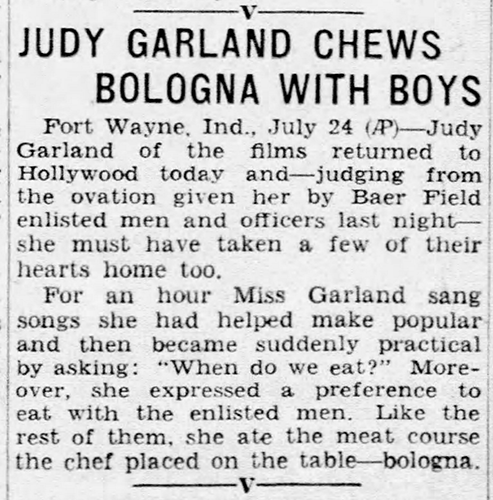 It must have been quite the thrill for soldiers to see Judy on screen and in person. In the first clipping, there is a fun article about the man “hired just for a laugh” during the “Tom, The Piper’s Son” number. 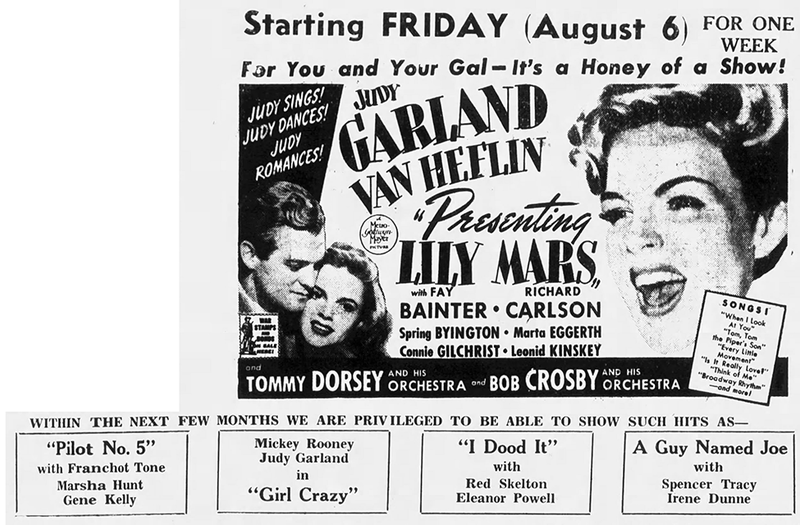 July 25, 1951: Judy saved herself by singing! According to Harrison Carroll, while Judy was in Nice, France, she was recognized by the public who rushed her. She “leaped on a bench” and sang, and ended up singing for an hour. Judy was in the south of France in mid-to-late July after her successful tour (her first ever concert tour) of England and Scotland so this event could very well have happened. 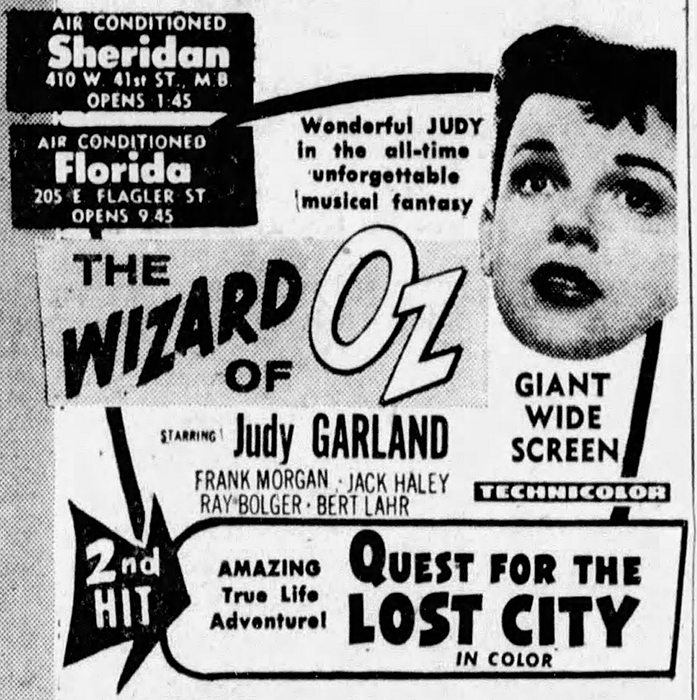 July 25, 1955: Here’s an odd advertisement for the re-release of The Wizard of Oz. It’s the only time I’ve seen a photo of Judy from her recent Warner Bros. film A Star Is Born. 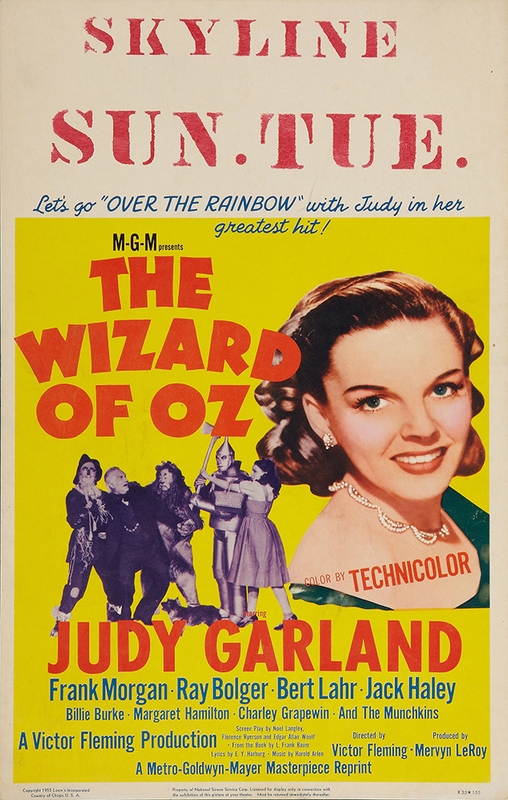 MGM’s official artwork for the re-release featured photos of Judy taken at, naturally, MGM (see example above). They would never have approved the use of a photo from a rival studio. This must have been the result of some clever editing at the newspaper, The Miami News. Whatever the case, it works quite nicely! 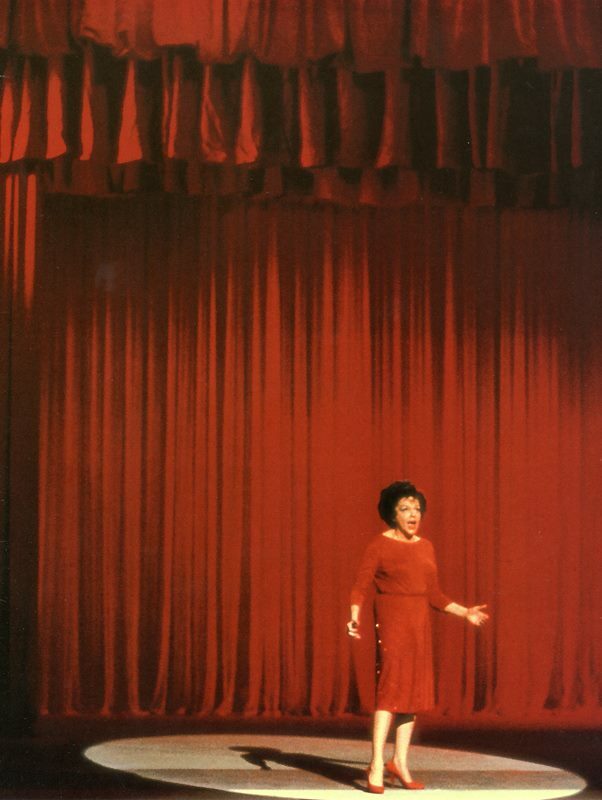 Check out The Judy Room’s Extensive Spotlight Section on A Star Is Born here. 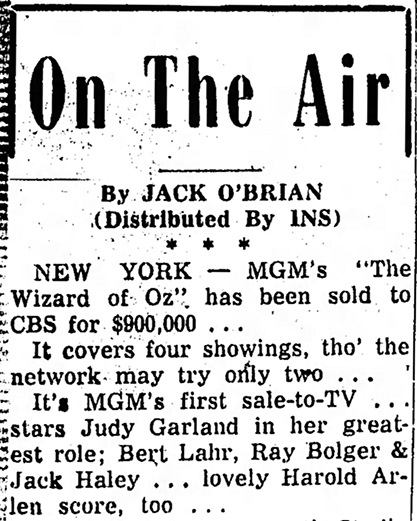 July 25, 1956: Judy a year after the successful theatrical re-release of The Wizard of Oz, MGM sold the film to television. 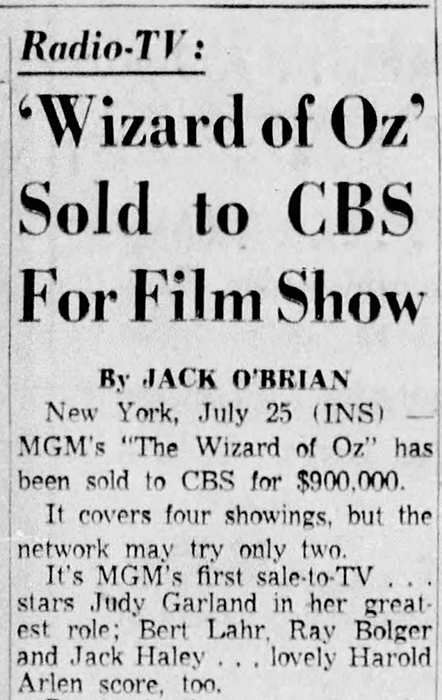 It was a first for the studio, and CBS allegedly asked for Gone With The Wind and was turned down flat so countered with “what about The Wizard of Oz?” The news of the sale made the papers but it wasn’t huge news. It turned out to be a milestone in movie and television history because, as we know, the film first aired in 1956 followed by a second airing in 1959 and every year after until 1998, creating a legend. 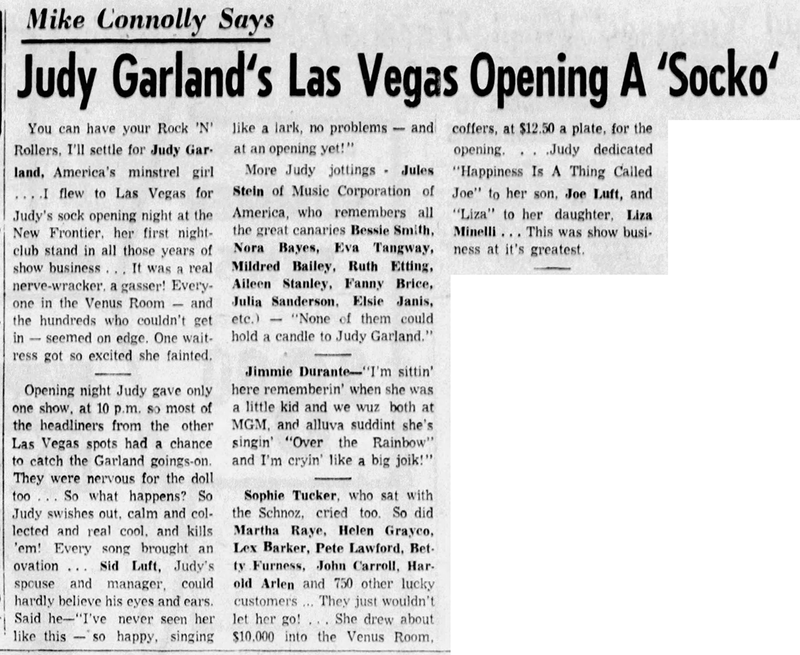 Also on July 25, 1956: Another rave article about Judy’s recent nightclub debut in Las Vegas on July 16th. Her engagement ran through August 19th. 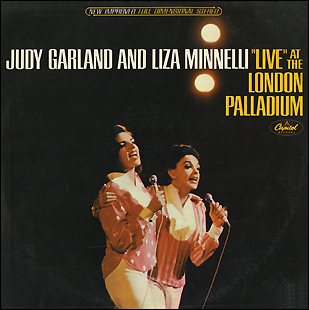 July 25, 1965: “Judy Garland and Liza Minnelli ‘Live’ At The London Palladium” was released by Capitol Records. The two record set peaked at the #19 spot on the charts in the fall of 1965. The album has been a source of some controversy over the years due to the odd order of the songs (Judy never began a concert with “The Man That Got Away”); the quality of Judy’s voice on some of the tracks; and the two aborted attempts by the late Scott Schechter to release the complete concert on a 2-disc CD set (see the PDF link below). The late Scott Schechter tried twice to get a complete (or as complete as possible at the time) CD set released with almost all of the recordings from both nights, including the tracks that Judy and Liza re-recorded in the Capitol studios months later, but he was unsuccessful. DRG Records released a slightly expanded version on CD in 2010. Read Lawrence Schulman’s extensive history of the “plagued” recording published in the ARSC Journal in 2009. It’s a definite must-read for any fan. It’s fascinating! Photos: The original cover artwork; Judy at the Mark Hopkins hotel in San Francisco on August 25, 1965, looking at the album while being interviewed. 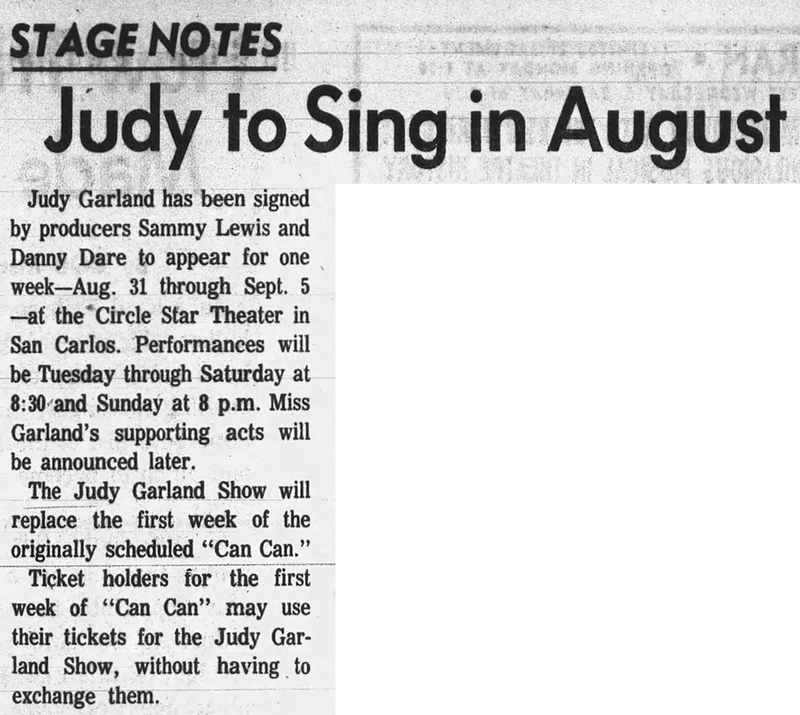 Also on July 25, 1965: This notice about Judy’s upcoming engagement in San Carlos, California. 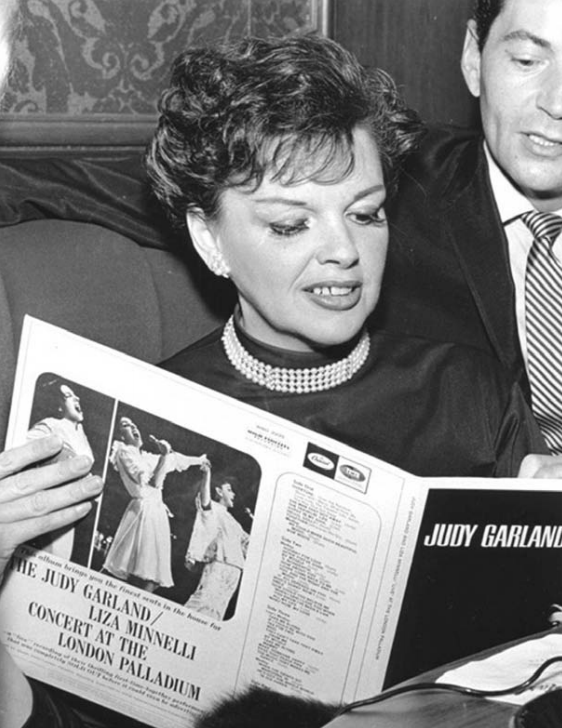 It’s notable because it was Judy’s first appearance in “the round,” and the turning stage made her uneasy on opening night but she adapted quickly and had no problem the rest of the nights. She was in concert there through September 5th.